An inertial frame is a frame of reference within which an object interacting with no forces (an idealized situation) appears either at rest or moving uniformly in a straight line. This is the fundamental definition of an inertial frame. 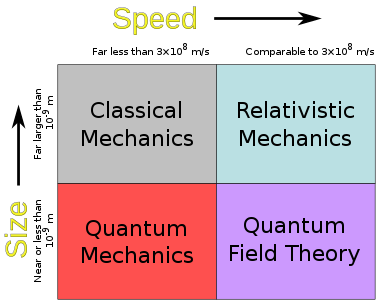 These are characterized by the requirement that all forces entering the observer's physical laws[clarification needed] originate from identifiable sources caused by fields, such as electro-static field (caused by static electrical charges), electro-magnetic field (caused by moving charges), gravitational field (caused by mass), and so forth. ^ The notion of "classical" may be somewhat confusing, since this term usually refers to the era of classical antiquity in European history. While many discoveries within the mathematics of that period are applicable today and of great use, much of the science that emerged from that time has since been superseded by more accurate models. This in no way detracts from the science of that time as most of modern physics is built directly upon those developments. The emergence of classical mechanics was a decisive stage in the development of science, in the modern sense of the term. Above all, it is characterized by an insistence that more rigor be used to describe the behavior of bodies. Such an exacting foundation is only available through mathematical treatment and reliance on experiment, rather than speculation. Classical mechanics established a way to predict the behavior of objects in a quantitative manner and ways to test these predictions through carefully designed measurement. The emerging globally cooperative endeavor provided increased scrutiny and testing of both theory and experiment. This remains a key factor in establishing certainty in knowledge and in bringing it to the service of society. History shows how closely the health and wealth of a society depend on nurturing this investigative and critical approach. ^ The displacement Δr is the difference of the particle's initial and final positions: Δr = rfinal − rinitial. ^ Thornton, Stephen T.; Marion, Jerry B. (2004). Classical dynamics of particles and systems (5. ed.). Belmont, CA: Brooks/Cole. p. 50. ISBN 978-0-534-40896-1. ^ Page 2-10 of the Feynman Lectures on Physics says "For already in classical mechanics there was indeterminability from a practical point of view." The past tense here implies that classical physics is no longer fundamental. Kleppner, D.; Kolenkow, R.J. (1973). An Introduction to Mechanics. McGraw-Hill. ISBN 978-0-07-035048-9. Landau, L.D. ; Lifshitz, E.M. (1972). Course of Theoretical Physics, Vol. 1 – Mechanics. Franklin Book Company. ISBN 978-0-08-016739-8. Morin, David (2008). Introduction to Classical Mechanics: With Problems and Solutions (1st ed.). Cambridge: Cambridge University Press. ISBN 978-0-521-87622-3. * Gerald Jay Sussman; Jack Wisdom (2001). Structure and Interpretation of Classical Mechanics. MIT Press. ISBN 978-0-262-19455-6. O'Donnell, Peter J. (2015). Essential Dynamics and Relativity. CRC Press. ISBN 978-1-4665-8839-4.